If you want a battlewagon capable of cruising to the canyons but your budget is limited, the 1980s vintage Ocean Yachts 42 is one used boat you may want to check out. As the sun peaked over the horizon one day last spring, we cruised through the inlet to film our Boys versus Tiger Shark video aboard a 1980s vintage 42 Ocean Yachts. At this age, these boats may not be the prettiest or the fanciest on the ocean, they aren’t the fastest and they aren’t the smoothest riding. 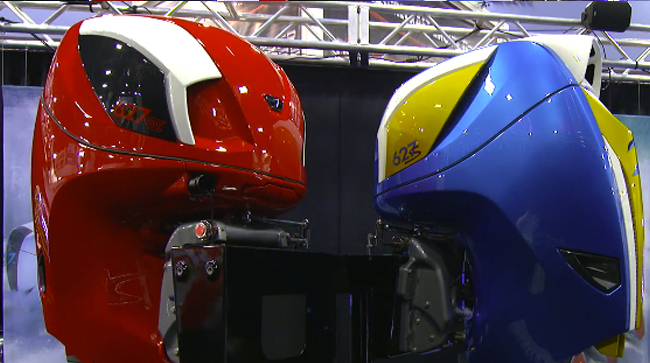 But they are capable fishing machines that go for a relatively low cost. 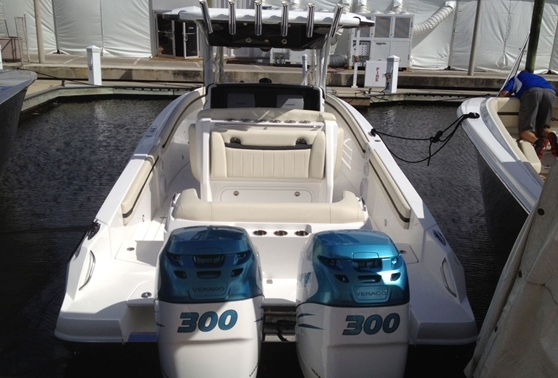 In fact, a recent survey of the used boats on Boats.com showed that you can pick one up for between $50,000 and $80,000—and there are lots of them around, as this was an extremely popular model in the day. 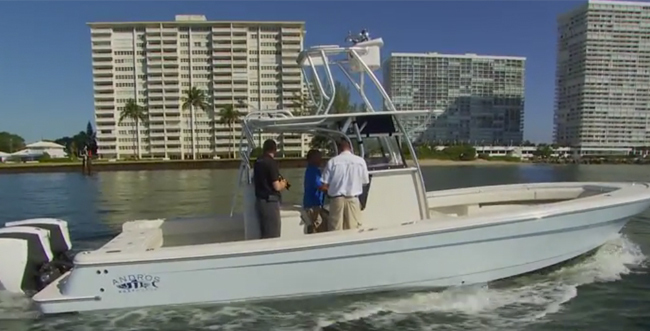 That’s pretty darn inexpensive for a convertible sportfishing boat of this size, especially considering that nearly-new models of the 42 go for more like half a million dollars. The Ocean Yachts 42, seen here in its latest incarnation, has been built since the late 70s. It was quite popular during the 80s, and there are plenty of used 42s on the market today. 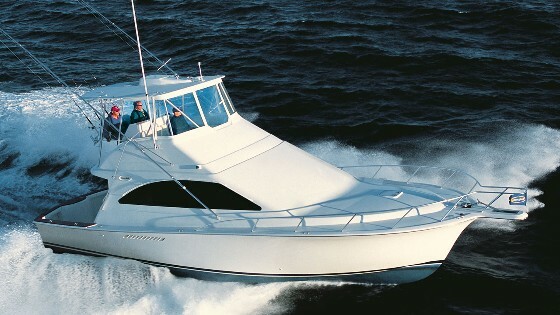 The layout of this boat is good for angling, with an open cockpit with wide gunwales and just over 100 square feet of fish-fighting space. On the early 80s version there’s a single cockpit unit to starboard with a ladder going up to the bridgedeck, and most models will have a lower control station to port. There are gaff/mop stowage boxes under each gunwale, and both raw and freshwater washdowns. 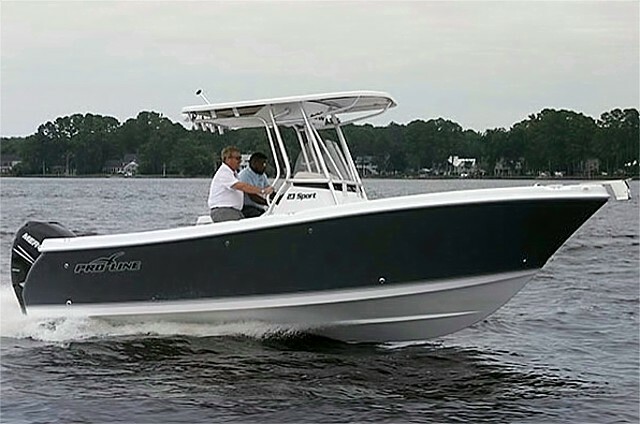 Two down-sides: most of the older versions of this boat were built without large insulated fishboxes, which means you’ll need to haul either a cooler or a fish-bag. Secondly, the older boats were also built without livewells. You’ll likely find a pair of Detroit Diesel 671s under the deck of an 80s vintage model, in 410 or 450 horsepower, though many of these boats have been repowered by now so they could have a variety of powerplants. 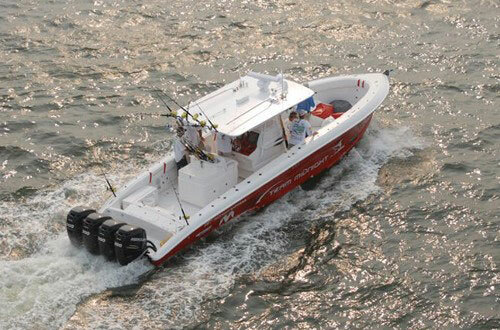 The lower horsepower models can be expected to cruise at around 20 to 22 knots while burning 34 to 38 gallons per hour, and those with bigger power should cruise between 22 and 24 knots while burning 36 to 40 gallons per hour. That may not be considered fast in this day and age, but a few decades ago it was better than average. 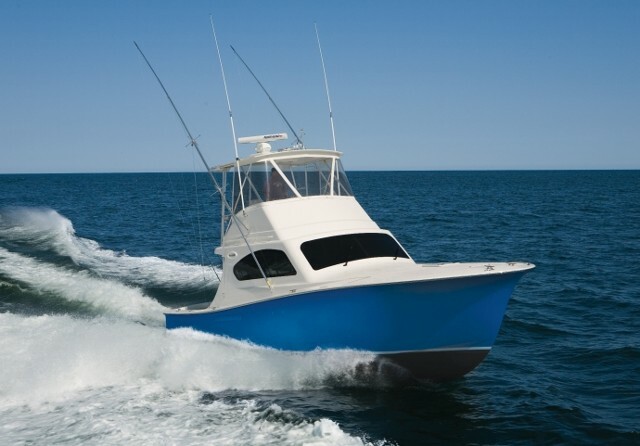 These boats are likely to out-run those of similar size and age by a couple of knots—and in any case, it’s plenty of speed to take you to bluewater and back for a day of fishing. 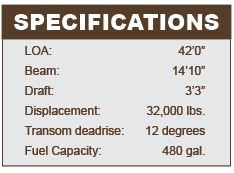 Range won’t be a problem, either, since the boat hauls 480 gallons of fuel. In a head sea, the boat proves competent if not exemplary. 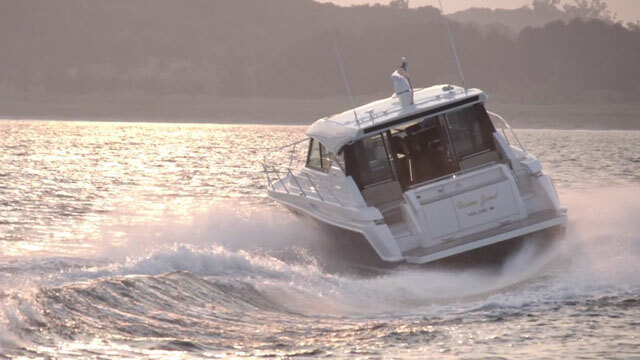 This is a relatively light boat for its size (a comparable Viking or Bertram built in the early 80s can be expected to weigh 20- to 25-percent more) and it will feel the effect of slamming into waves more than some other boats of its size. In a beam sea it’s relatively stable, and in a following sea, there was only a slight tendency to bow-steer. Belowdecks, the main salon on the boat we tested featured the normal arrangement: An L-shaped settee to starboard, a galley forward to port, and a two stateroom lay-out below. On overnight fishing trips you’ll have room for a half-dozen anglers to sleep when the bite is slow. Like all used boats with some age on them, the condition of the 42s you look at is bound to vary quite a bit. 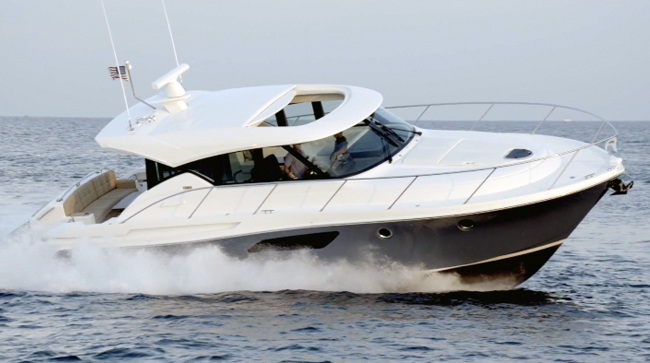 But if you’re looking for an inexpensive way to get into a canyon-capable convertible, the Ocean 42 is a good bet.